"I never worry about them while they're in her care." "...we are very happy with the thoroughness, quality and price of her service to our pets, and the peace of mind we have by using her." In the News: Read Standard Times Feature Article! When you leave town, you would like to be assured that your pets are treated as well as they are when you are at home, and The Royal Touch Pet Sitting offers loving care, kindness, and play-time in addition to caring for their physical needs. You can enjoy your vacation, knowing that your pets are treated as though they were my own. I am in this profession because of my love for animals, and I would like to become your pet's companion as well as its interim caregiver. 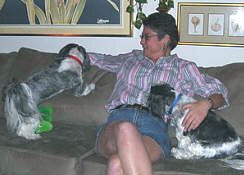 The Royal Touch Pet Sitting offers the unique opportunity for your pets to stay at home in their own environment, where they are most comfortable, and to be petted, played with, talked to, nurtured, and, most of all, loved.